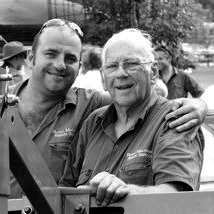 We are a father and son team servicing the Northern Rivers, all the way from the Tweed to Richmond Valley, and are the people to call for Tractor and farm maintenance machinery including acreage mowers. Whether we are traveling out to you in our full service all terrain vehicle for on the farm repairs, or taking your machine back to our fully serviced workshop, we’ll look after you every step of the way. RMRS also offer a complete restoration service for vintage tractors, specialising in Massey Fergusons and David Browns. If you’re looking for an old (or even not so old) tractor, (or even tractor parts), we’re happy to source it for you and do any restorations or repairs required. That way you can get exactly what you’re looking for to your budget and specifications. We will service your machine for a flat rate , ask for our rates Ph (02) 66 88 4143 or 0407 435 259. We offer a pre-purchase inspection service if you’re in the market for a tractor and think you’ve found what you’re after, but aren’t sure if it’s in good working over. For a Fee we’ll meet you onsite and look over the vehicle with you. So give us a call and we’ll be happy to help! Restored Ferguson’s and our work vehicle on display at the Bangalow Show, 2012. Drive through Federal and turn right at Charltons Road, when you get to a 3-way fork take the far right track down the driveway. No Job is to big or to small. When you trusty workhorse needs some help, call the Rural Machinery Repair Service. Based in the Byron Shire, we’re a father and son team who service the Northern Rivers region, including Lismore, Kyogle, Nimbin, Casino, Ballina, as well as Byron Shire and the Tweed, and are the people to call for ALL Tractor and farm machinery repairs and problems. We are a family business dedicated to supporting the many businesses and families in the Northern Rivers who use farm machinery in their daily lives. The machines we use to work the land and maintain our properties have a tough life and have to work hard, so from time to time they are going to need maintenance and repairs. From our years of experience in repairing and restoring tractors, zero turn mowers and all your farm machinery , we can offer a comprehensive break-down and maintenance service, just when you need it most, with expert diagnosis, sourcing of parts, and professional and efficient repair work on call to the farm, or we can arrange transport back to our workshop. We guarantee our work. We are Massey Ferguson Specialists and offer a complete tractor restoration service. We also work on all other brands, as well as working on Chinese tractors. If your tractor or farm machine is in need of expert repairs, call us now for a no obligation estimate.